To start things off we would like to thank our loyal customers whom shopped with us year after year. 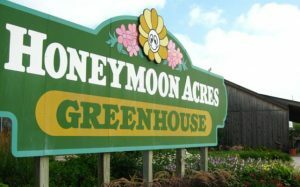 Honeymoon Acres is a proud greenhouse business that could not have made it so many years without you. 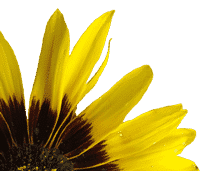 Since it seems like we share the same love for plants as you, you may be interested to know who we are and how this fine establishment started. One of the owners, Joe McShaw, will tell his story. Hi, my name is Joe McShaw. You may have seen me around the greenhouse and maybe you haven’t but that is where I spend most of my day. I’m the one who is responsible for the plant’s quality and plant care. So please remember if there is any issues with the plants in the greenhouse, it is my concern not the others that work here. If there are any issues, problems or concerns regarding the plants, please ask for me to answer them. So let's discuss how I got to where I am. Well I, Joe, grew up in a Pennsylvania with my many siblings and many chores to do everyday. My Dad, Andrew, and my mom, Ann, ran a greenhouse, vegetable farm, honeybee farm, and also a side business doing carpentry. So I grew up learning a versatile abundance of things. It sure made me realize what hard work was. I learned a lot on the farm that has helped me in the greenhouse. On the farm I was the youngest of 10 siblings; Dave, Don, Judy(passed away battling cancer), Larry, Ron, Joann, Fred, June and Jane (they are twins) and then there is me. My mom passed away when I was 9 years old, so my dad was left to raise us. We learned a lot from a hard life and the struggles that goes along with it. In 1980 after some years left doing work at home and spending sometime in Wisconsin, Canada, and Florida (helping my brothers with their businesses), I graduated high school and found it was time to move permantly to Wisconsin. I worked for my brother, Don, in the greenhouse and also worked with my other brother, Dave, with his honeybees. In 1983 I married my lovely wife, Marci. Marci and I have four children. Chad, Clinton, Dwight, and Falena. As of right now three of them, Clint, Dwight and Falena, work with us at the greenhouse. Chad decided to pursue other goals in life. He did not find that the greenhouse life was for him. Working in the greenhouse is not just a job, but a way of life. To live a full life, you must find a job that you love. The way I got started to love plants was from my past. I also enjoyed being my own boss and doing things the way I thought they should be done. At age 22, year 1984, Marci and I started Honeymoon Acres. At the beginning, we would tear down many old barns for people. We would then use those barn boards to build greenhouses. That was the start. The first greenhouse we had a total of 1,000 square feet, a 20’x50’ greenhouse. During this time, Marci and I both had full time jobs, children to take care of, and we also had our 5 acres of vegetables. We would take the produce down to the corner of the old Red & White restaurant in New Holstein to sell on Saturdays. However, the next few years we expanded more of our greenhouses. It has been truly an American dream that we achieved so much. I moved to Wisconsin in 1980 and with my wife in 1984 we stared our business with only $5.00 in our pocket. We had a young family and a business to hold up. 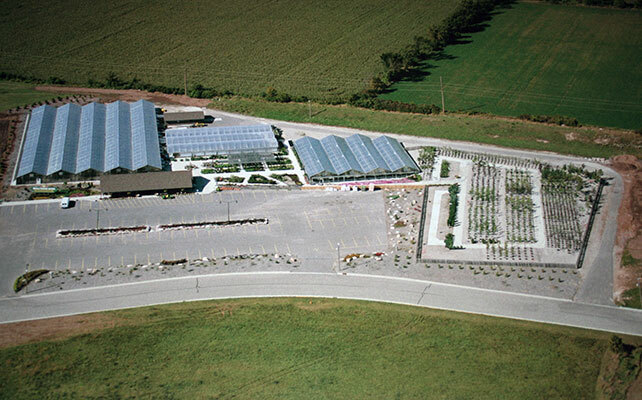 Around 1990, our greenhouses were beginning to expand much more. We had to decide to either to do more with the greenhouses or expand the vegetable farm. At the time of this debate the greenhouses were doing much better than the vegetable farm. So we put all of our attention towards the greenhouse and it took off to what it is today. 2002 was the next time we had to make a large decision. 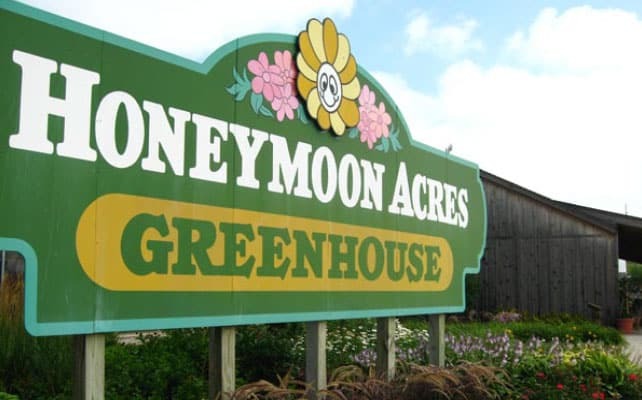 We had about 60,000 square feet of greenhouses on Honeymoon Hill Road so we had many customers coming through. Having so many people come to our greenhouse on Honeymoon Hill Road, made things change for us. The store on the highway consists of an “annual” greenhouse of 27,000 square feet, a “perennial” greenhouse of 10,500 square feet, a "pepper" greenhouse of 1,800 square feet, a "tomato" greenhouse of 1,800 square feet, a "vine crop" greenhouse of 1,800 square feet, a "cool crop" greenhouse of 1,800 square feet, a "herb" greenhouse of 1,800 square feet and a salesroom of 3,000 square feet. We also have an outdoor area for displays of lawn ornaments, our nursery stock, and overflow of perennials and other plants that is about 20,000 square feet. In addition we have extra greenhouses on the upper part of property and out in our field that is used strictly for overflow of plants. The picture featured is an old one. We have changed the parking lot around and have moved the area for nursery stock and the greenhouses are fenced in with beautiful pillars and metal fencing. When you pull into our establishment, you will not believe your eyes in spring. It sure is beautiful, especially when everything is in bloom. We have purchased the land on both sides of us. First the field. The field consists of extra greenhouses for overflow of plants and it also has sections for our produce to grow and sold in summer along with a larger section for pumpkins and gourds to be sold in fall. We also now have ownership of the building next to us that we are using as a production site, in which we will plant up and seed out our plants here. It is a great addition to expanding and will make everything easier in the long run. The land in between our production site and the retail store will be used for parking. Hopefully we will finally have enough in spring! We still have our old place on Honeymoon Hill Road, but it is an overflow facility only. It consists of an area just to grow our plants so that can reach their full potential to be moved and sold at the location on the highway. Just think we need to water and take care of plants in all locations of greenhouses and we fill both areas for spring too. Our business is truly a blessing. Through all of the struggles and situations we always seem to pull through. Another blessing is our kids. They are all a pleasure to work with and be around. Clint and Dwight help me out in the greenhouse growing part of the plants and moving them from the growing location, Honeymoon Hill Road, to the store location, Ford Drive (Hwy 57). Dwight also works another division of the business. He does landscaping for customers. Falena is there to assist Marci in the salesroom as a cashier and customer service. She also works as the designer of the website you are viewing right now. Both Marci and Falena help a lot to grow the plants until we get busy enough that they need to help customers instead. We also have a couple other full time employees. Allison is one employee that is actually married to Dwight. They work together in the landscaping and she also helps in the salesroom with Marci and Falena. Evan is the other employee that is engaged to Falena. Evan helps out in the greenhouse moving, growing, and organizing the plants with Clint, Dwight, and myself. We also have another full time employee, Johanna, that helps in the salesroom along with other various jobs. We would appreciate it if you could continue to be patient with us. We understand that the wait in spring is long at the checkout, but we try to go fast. We also apologize too that it may be hard to find a person to answer questions. We try so very hard to make this the best place to buy plants. We are provided with some help by close friends that eases the stress of our spring. Some people ask why we just have eight full time people to do what other greenhouses need ten to twenty people to do. One is to keep the cost of our plants down. We can't afford too many people working. Another reason is that it is hard to find people to hire who have an abundant knowledge of plants to assist customers. We only need extra people for four to six weeks, then it slows down. So there would be no point. There is a lot more to add to this story but it is getting pretty long. I hope this gives you an idea how much me and my family love our business. We are truly thankful for everyone who comes to our place to purchase our plants. We are proud to be one of the best greenhouses in Wisconsin!